Stunning Architectural Custom Tri- level Loft Style 3 bedroom townhome with approx. 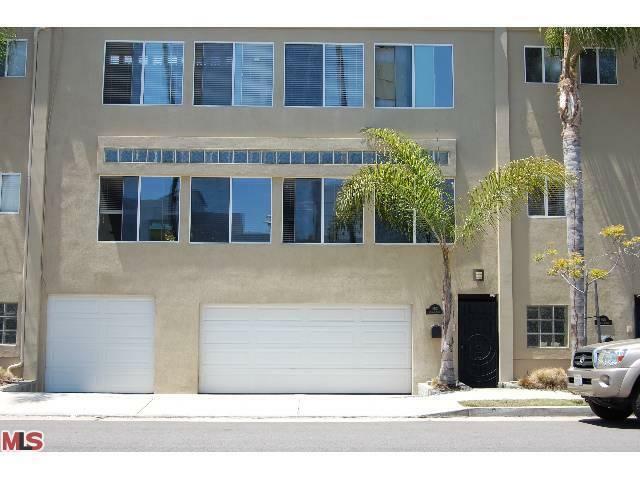 2000 sq ft + Awesome Bonus Room in the heart of Venice! Enter into your own private vestibule with direct access to a 2 car garage + private 3rd car garage with attached bonus room big enough to be an additional family/hang out room, office and gym. Gorgeous Hi-Tech Cooks Kitchen with Viking Range and S/S appliances, custom cabinets, granite counter tops and walk-in pantry open to a chic entertaining great room with tremendous volume. Upstairs features large master with vaulted ceilings, walk-in closet and luxurious bath with double sinks, over sized shower and spa tub + 2 additional good sized bedrooms with treetop vistas. Beautiful Brazilian Cherry wood floors, recessed lighting, surround sound, roof top access with views to the ocean, windows galore offering great natural light are only a few of the features you will find in this townhome that feels like a single family home. A true delight!